View topic - [Coding competition 2016] MARKanoIIId (interactive demo) by sverx, Kagesan, Tomy - Forums - SMS Power! This is an "interactive demo". This means that you can actually somehow 'play' it, even if it's not a proper game (yet?). We tried to make it very colorful and visually enhanced, and to have an equally enhanced soundtrack. Of course it uses devkitSMS/SMSlib, and PSGlib for the background music. Controls: left/right to move paddle, pause key will directly skip to next level. 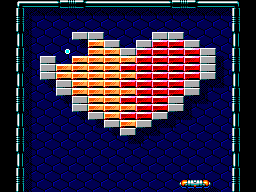 Includes 4 different levels and 2 catchy tunes for your enjoyment. 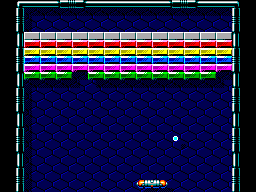 The demo progresses to the next level when all the blocks on screen have disappeared. Blocks disappear when the ball bounces against them. Silver blocks need to be hit twice, golden blocks are indestructible. Got to level 2 thinking i was king then realized about the floor hehe. Still fun controlling trajectory. The gold level was nasty, remind of those ricochet shots i can never to in pool. Man, this is some great music. Puts me oddly in mind of Devil's Crash/Dragon's Fury. Also wanted to let you know that this sounds best on real SMS hardware. With emulation Emulicious & MEKA are the best, as far as I know everything else has the noise channel balance off.